Campaign voluntary removal of vehicles abandoned on private land. 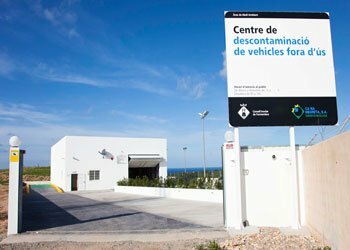 On December 9, 2011 was inaugurated the center of Formentera decontamination of vehicles, which fills a major shortcoming of the island in terms of vehicle handling low end of its useful life. This center is a reality thanks to the impulse of Formentera Island Council, through the State Aid Plan E and enable the vehicles are decontaminated and to process its low in Formentera, no need to move to Ibiza. This new campaign will be conducted with the assistance of the concessionaire for operating, Negreta Na Ca and is focused on cars and motorcycles abandoned on private property. The purpose of this campaign is to contribute to the enhancement of the landscape and environment of Formentera, since the removal of these vehicles will help to minimize the visual impact generated by its abandonment as well as reducing the risk of soil contamination . The period for making the request for withdrawal starts February 1 and ends on February 29, 2012.
a) The holder of the land and the vehicle match. You must apply through a formal request, including document proving ownership of land (certified writing, last IBI receipt, rate of waste, etc..) As well as an express authorization to access the place where the vehicle is abandoned. Click here to download the form if it is your case. b) The owner of the vehicle is not the holder of the land. Provide formal complaint removed from the vehicle, including its data and preferably permission of the landowner, to be attached document evidencing title to the land (deed attested, last receipt of IBI, waste rate, etc.).. Click here to download the form if it is your case. c) The owner of the land not the owner of the vehicle. You must submit the request for removal of the vehicle, along with a document certifying the land ownership (deed attested, last receipt of IBI, waste rate, etc.). If possible must submit a copy of the documentation as well as an express authorization of the owner of the vehicle if available. In case you can not contact the vehicle owner will continue the processing carried out by the ordinance, which will require a longer time in his retirement and this will depend on each case. Click here to download the form if it is your case. Since we can find different cases, to qualify for the campaign must first be phoning 971.31.69.33 Negreta Ca Na, which indicate the documentation you need to bring and what the next steps. It is reported that once the deadline for applying for the voluntary withdrawal of charge, will proceed to take minutes of those abandoned vehicles on private property, with the corresponding administrative sanction according to the ordinance regulating the removal of vehicles, published in the BOIB no. 165 of November 13, 2010.